CARFAX 1-Owner, Excellent Condition, GREAT MILES 16,512! Must See Nebula Gray IS 300! EPA 32 MPG Hwy/22 MPG City! Navigation, 18" Wheels, Park Assist, Premium Package with Heated/Cooled Seats and more! Call 210-816-6000 to test drive! 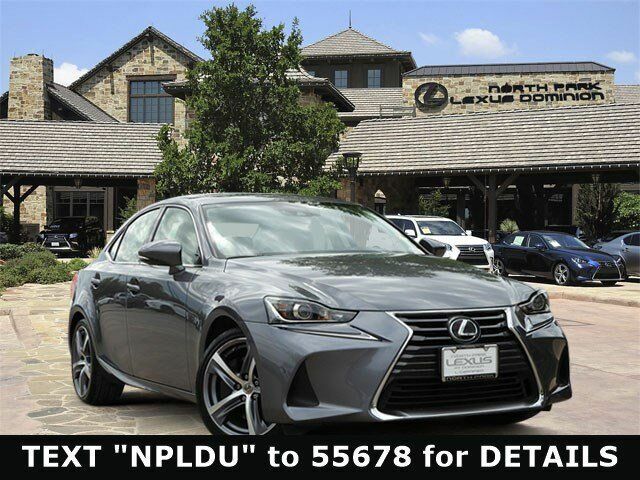 Safety equipment includes Lexus Safety System+ with Pre-Collision System (PCS), Pedestrian Detection, High Speed Dynamic Radar Cruise Control, Lane Departure Alert with Steering Assist and Intelligent High Beam Headlamps, Back up Camera, Traction Control, Vehicle Stability Control, 10 Airbags. Power Moon Roof, Homelink, Dual AC, SmartAcess with push button Start/Stop, USB/iPod Connection, Sirius XM Radio, HD Radio, Subscription Free Traffic and Weather Updates, Enform App Suite. NAVIGATION SYSTEM Lexus Enform Destinations, destination assist and eDestination ( included, requires Lexus enform safety connect), Lexus Enform App Suite (Subscription Free), destination search, Yelp, iHeartRadio, Facebook Places, Movietickets.com, OpenTable, Pandora, slacker, stocks, fuel prices and sports, Lexus Insider, Radio: Lexus Display Audio w/Navigation System, AM/FM/in-dash CD, HD Radio (complimentary traffic and weather), 10.3" screen w/back button on remote touch interface controller, 10 speakers, 293-watts, digital signal processing w/Automatic Sound Levelizer (ASL), integrated SiriusXM satellite radio receiver (complimentary included), Scout GPS link, iTunes tagging, MP3/WMA and dual USB/iPod audio input plugs, rear, COMFORT PACKAGE Power Steering Column, 2 Position Memory, memory for driver and passenger seat, heated outer mirrors and steering column, Blind Spot Monitor w/Cross Traffic Alert, lane change assist, Rain-Sensing Windshield Wipers, WHEELS: 18" 5-SPOKE ALLOY Tires: 225/40R18 Front & 255/35R18 Rear All-Season, INTUITIVE PARK ASSIST clearance and back sonar, PREMIUM PACKAGE W/COMFORT PACKAGE Heated & Ventilated Front Bucket Seats, ACCESSORY PACKAGE Cargo Net, Carpet Trunk Mat, Key Gloves, Alloy Wheel Locks.